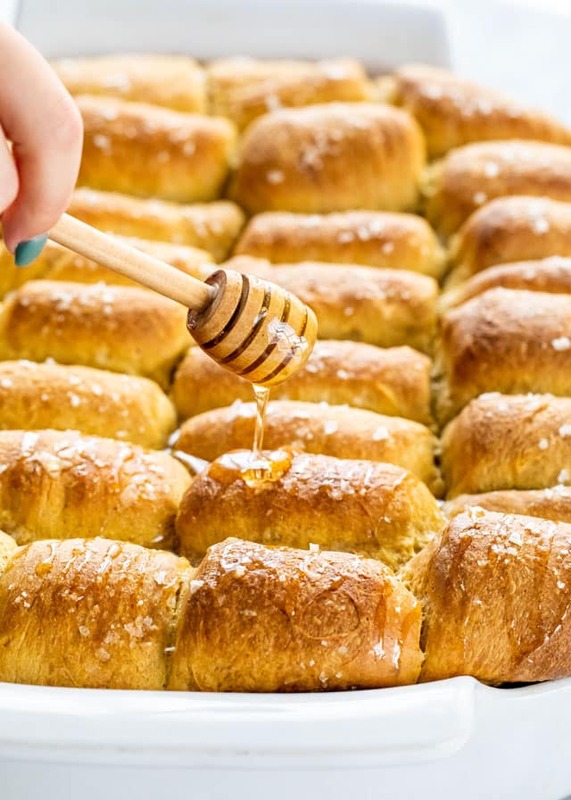 These Parker House Rolls are tender, light and fluffy, super soft on the inside and pumpkin flavored! 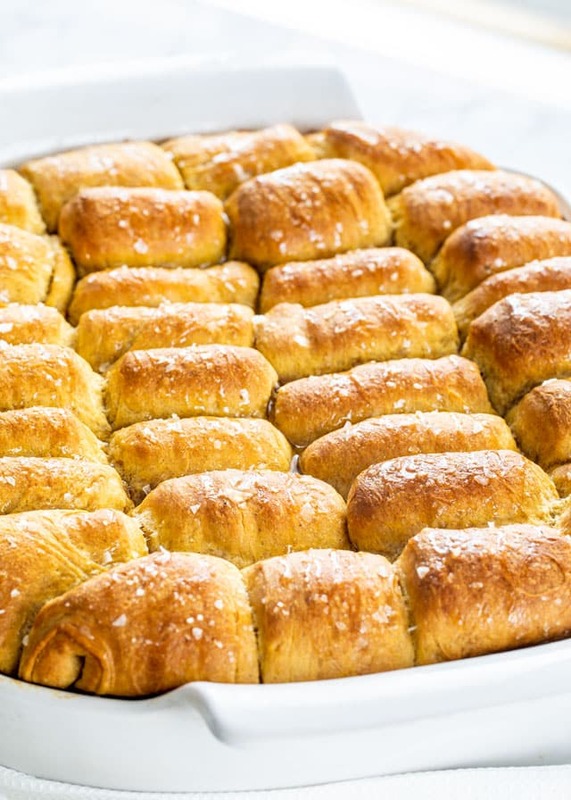 No holiday table is complete without these perfect rolls. These. Rolls. Are. Everything. They are pure perfection. 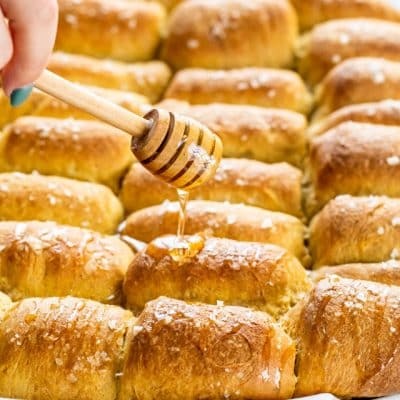 Soft and tender, light and fluffy, brushed with lots of melted butter, topped with sea salt and finally drizzled with honey. Yeah, you got that right! 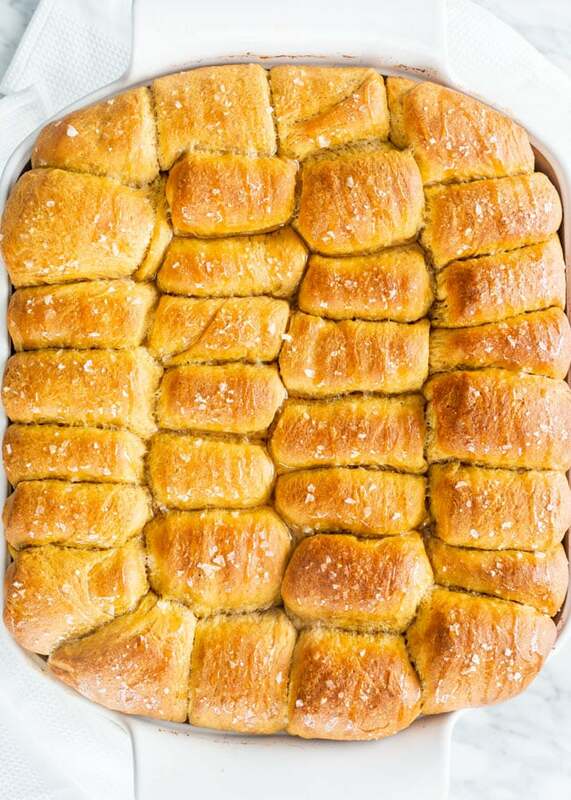 These rolls are where it’s at. 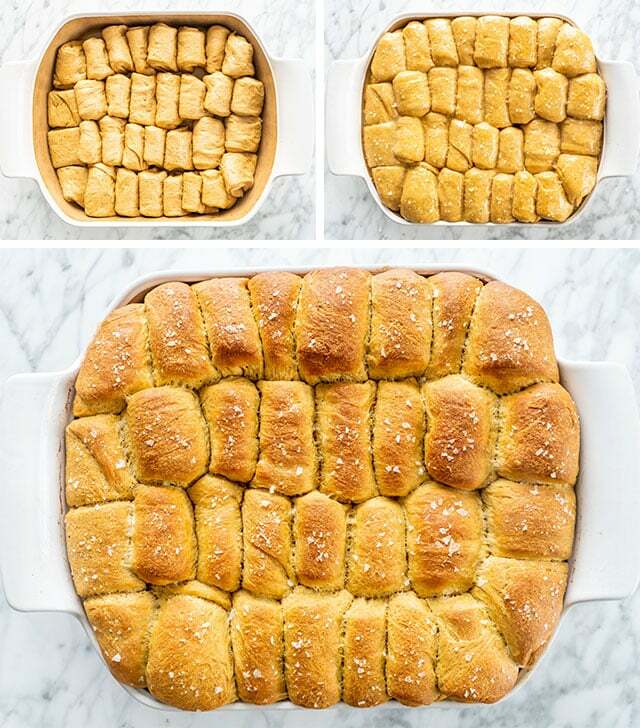 These rolls are what regular dinner rolls want to be when they grow up. I don’t think I’ve ever had rolls softer than these Parker House rolls. While there are many variations of these rolls, I decided to go with a pumpkin version, because it’s that time of the year. I personally love pumpkin in breads especially when you throw in some pumpkin pie spice. The smell alone is heavenly. Parker House Rolls were invented at the Parker House Hotel in Boston who started serving them in the late 1800s. They are bread rolls made by flattening the center of a ball of dough with a rolling pin then folding it in half. They are made with milk which is why they are generally super soft and tender. You knead it by hand! Back in the day there were no stand mixers and all bread and rolls were kneaded by hand. It’s a great workout, trust me because I have kneaded dough by hand many times. Start as instructed by combining all the wet ingredients together, then add the flour. Just keep on kneading until all the flour is incorporated. The dough should be soft to the touch and a bit sticky. The dough should be slightly sticky and pliable. Check out the video to see what the dough should look like. If kneading by hand, once all the flour is incorporated, I find it easier to spray some cooking oil on my work surface instead of adding flour. If you add more flour this will change the consistency of the dough and risk ending up with tougher rolls, while the oil will keep your dough from sticking to your hands or work surface. Sometimes, no matter how hard you try, your dough just won’t rise. It can be super frustrating, I know. I’ve had it happen to me many times. Here are some reasons as to why this could have happened. Old Dead Yeast: Yeast is a living organism and over time it will lose activity. This can happen even if you’ve never opened the jar or package. If you don’t bake often, buy the smaller yeast packages rather than a big jar of yeast. Yeast Is Too Hot: If using active dry yeast, it needs to be dissolved in either warm water or milk. If you heat up your liquid too much, this will kill your yeast. Yeast is pretty picky. It doesn’t like cold and it doesn’t like too hot. The Room Is Too Cold: Yeast prefers a warm, draft free environment, usually between 75 and 90 degrees F. There really is little wiggle room on either side. As I said, yeast is picky. To rise my dough, I usually preheat my oven to 175 or 200 F degrees then immediately turn it off. Let that cool for about 5 minutes then place your dough in there. This way your dough will be nice, warm and happy and will rise in half the time. Not Enough Time To Rise: Sometimes you just have to wait it out. I’ve had dough that really took 3 hours to double in size. Patience is key. If the recipe says to let it rise for 1 hour until doubled in size and yours hasn’t, just give it more time. Don’t forget that a slower rise results in a more flavorful bread. If in a rush, you can always use my tip above by warming up the oven first. CAN I USE INSTANT YEAST? Absolutely! It will even make your job easier since no proofing is required. That is basically the only difference between instant yeast and active dry yeast, no proofing required. Simply add the yeast to the rest of the ingredients and mix. You will still need to add the water and milk as instructed. Milk or water that is used to activate yeast, should always be warm to the touch, between 100 ad 110 degrees. Yes! You can freeze them either before baking, right after you shape them into rolls, or after baking. Make sure you properly wrap them with plastic wrap and freeze them until ready to eat. Remove them from the freezer 2 hours before popping them in the oven, this will give them enough time to thaw out. You can also freeze the rolls after you’ve baked them and allowed them to cool completely. I usually place mine in a freezer bag, about 6 rolls in a bag and freeze them until I’m ready to eat them. I just take them from the bag and microwave them for about a minute or until warm and thawed. In a medium sized bowl combine the water, yeast and a tsp of brown sugar from the 1/3 cup. Let this rest for 10 to 15 minutes until the yeast dissolves and gets frothy. Attach the dough hook to the mixer. Add the yeast to the bowl of your mixer, then add the milk, butter, eggs, pumpkin, and the rest of the brown sugar. Stir to combine. Mix in the pumpkin spice and salt. Start by adding 4 cups of the flour and mix on medium-low speed until combined. Keep adding flour 1/2 cup at a time until the dough starts to pull away from the side of the bowl, but is still slightly sticky. I used a total of 6 1/2 cups of flour. Keep kneading the dough in the mixer for about 5 minutes. Spray a large bowl with cooking spray. 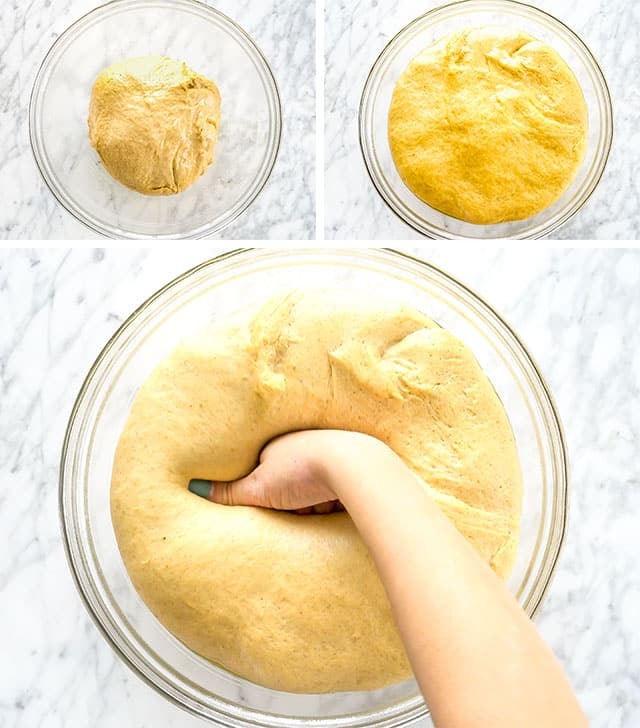 Shape the dough into a ball and transfer it to the bowl. Spray the top of the dough as well, cover the bowl with plastic wrap or a damp kitchen towel. Allow the dough to proof in a warm space for about 1 1/2 hours until doubled in size. See notes. Once the dough has doubled in size, remove the plastic wrap from the bowl and punch down the dough, to remove the air from it. Transfer it onto a clean work surface and roll it out into approximately 12x16-inch rectangle. 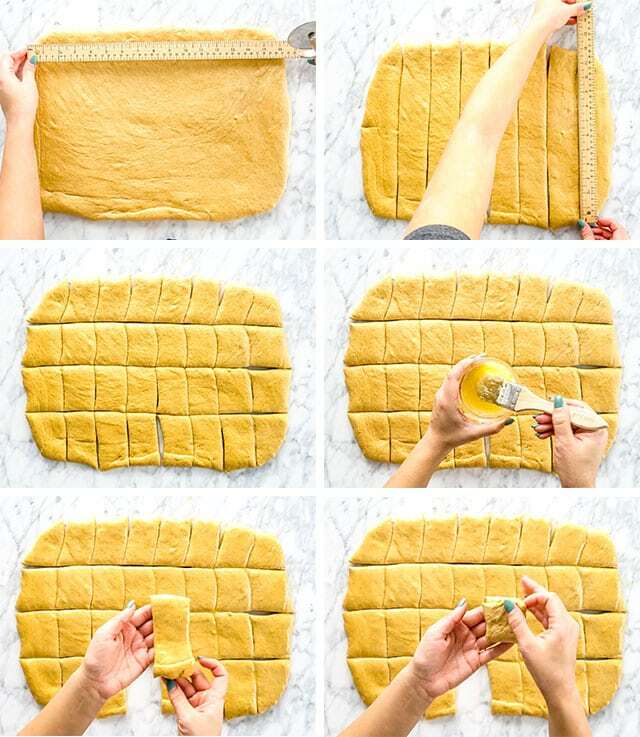 Cut the dough into 32 equal size rectangles, 2x3-inches each. See video on how to do it. Brush the rectangles with melted butter, using about 2 tbsp of melted butter. Take each rectangle and fold it in half. Place the roll in a 9x13 inch baking dish, smooth side up. Repeat with remaining rolls. Preheat your oven to 350 F degrees. Cover the rolls with plastic wrap and let them rise for another 30 minutes until doubled in size. Brush them with remaining 2 tbsp of butter and sprinkle with flaked salt. Transfer the rolls to the oven and bake for 20 to 25 minutes, or until the rolls are golden brown. Drizzle honey over them, if preferred, and serve warm. RISING: Preheat your oven to 200 F degrees, turn off the oven, then place the bowl with the dough in the oven until it doubles in size. Because this is a draft free environment and warm, the dough will rise faster, should take about 30 minutes. INSTANT YEAST: If using instant yeast, no proofing is required. Simply add the yeast along with the rest of the ingredients. Always check the expiration date on your yeast and make sure it hasn't expired. All your yeast products whether it’s in a jar or a package should be stamped with a “Best if Used by” date. Always make sure you check this date, even when you purchase the yeast, who knows it could have been on the shelf past its expiry date. To keep your yeast fresh and longer lasting, unopened yeast packages or jars should be stored in a cool or dry place such as your cupboard. However, you can also store your yeast in the fridge or freezer. If you do store it in the freezer and need to use yeast for your baking, make sure you take out the amount you need and let it sit at room temperature for at least half hour before using. Once your yeast package or jar has been opened, you must refrigerate the yeast or freeze it in an airtight container. Remember yeast is a living organism and over time it will lose activity, even if you’ve never opened the jar or package. So if you don’t bake often, buy the smaller yeast packages rather than a big jar of yeast. Recipe adapted from Red Star Yeast. I’m definitely making these soon! So good!! Can this dough be made in advance and frozen or just placed in the fridge for a day before cooking? 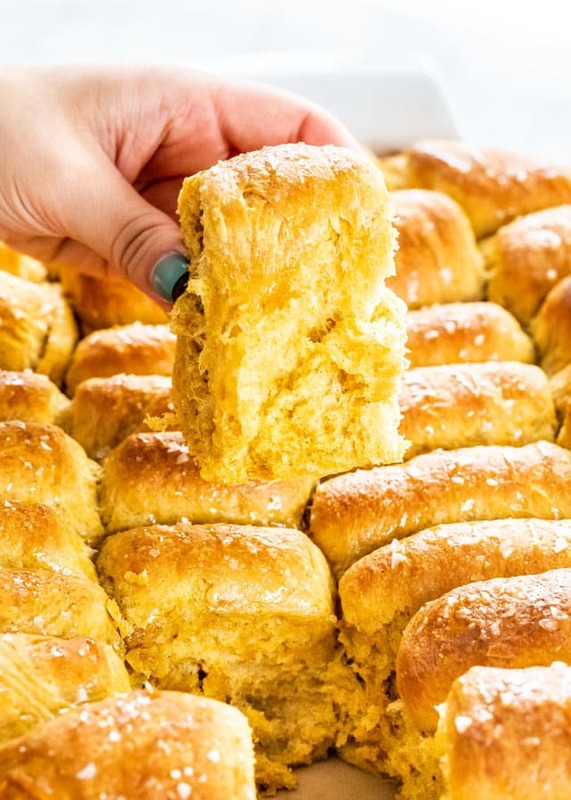 Can you make these rolls without the pumpkin. Does the ratio of any of the ingredients change? You can, they will still be soft from the milk. Just incorporate the flour, adding 1/2 a cup at a time, until the dough starts to pull away from the bowl but it’s still slightly sticky.